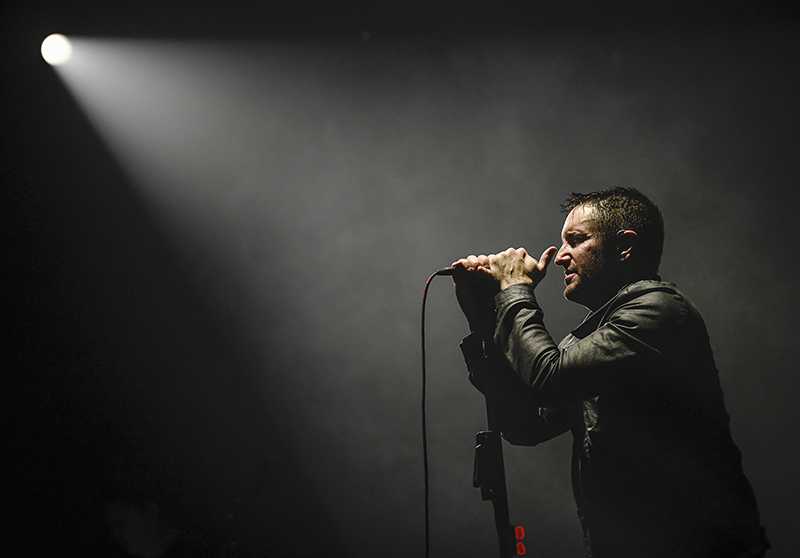 NINE INCH NAILS © Steve Jennings. 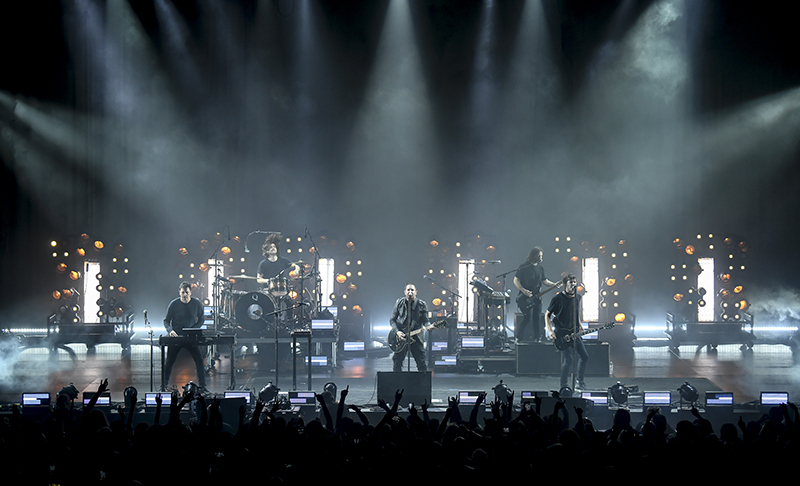 Nine Inch Nails: Atticus Ross (keyboards); Ilan Rubin (drums, guitars, keys, vocals); Trent Reznor (vocals, guitar, keys); Alessandro Cortini (keys, synths, bass, guitar, vocals); Robin Finck (guitars, vocals, keys). 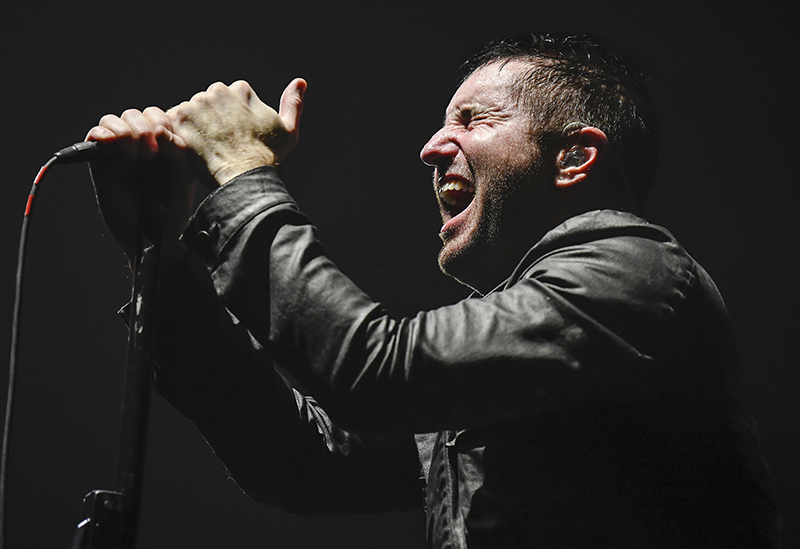 Before a final six-show residency at the Palladium in Los Angeles, Nine Inch Nails moved toward the completion of their “Cold and Black and Infinite” North America tour in early December with pounding rock solid performances for the sold-out crowds at a two-night stand in San Francisco’s Bill Graham Civic Auditorium. 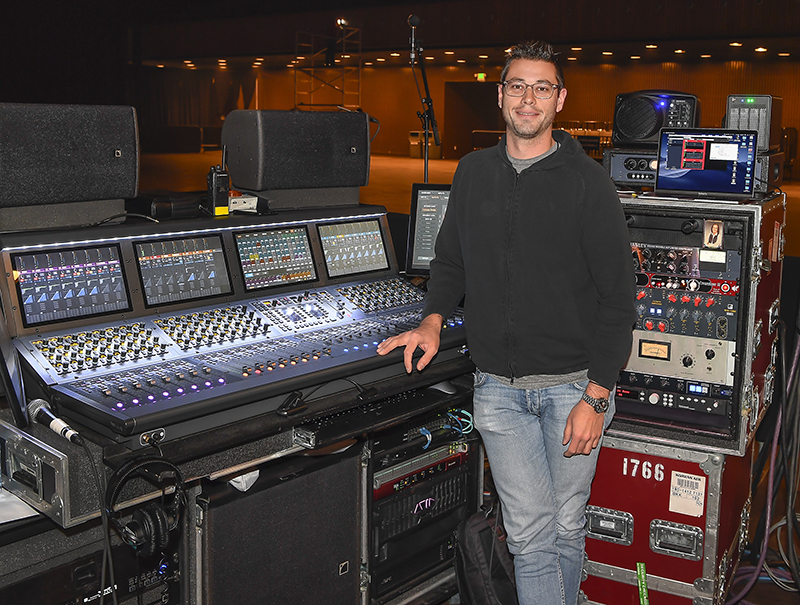 We caught up with key members of the audio team, including FOH engineer Jamie Pollock, monitor engineer Michael Prowda, systems engineer Andrew Gilchrest and content routing audio manager Chris Holmes. 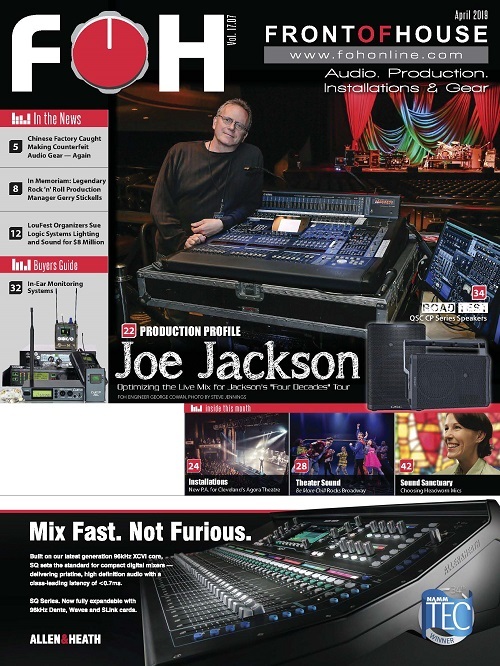 Pollock has about 80 inputs from stage and 18 matrix outputs for P.A., backstage fills and various sends. 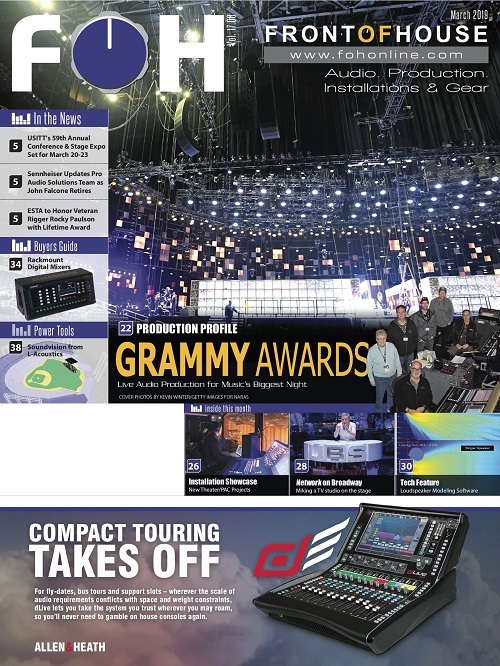 He also has a MADI card installed on the E6L engine to feed a Focusrite RedNet system for up to 32 channels of stems that he can send down their fiber to the stage for broadcast situations. 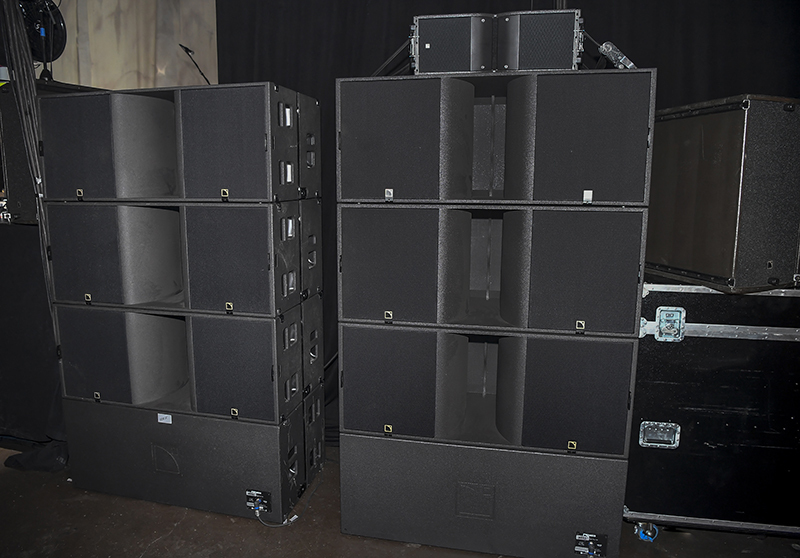 “There is RedNet D64R at FOH and two A16R’s on the stage end. I also use the other side of the MADI card to feed a DirectOut Technologies Andiamo 2 MADI converter for my analog outboard gear. 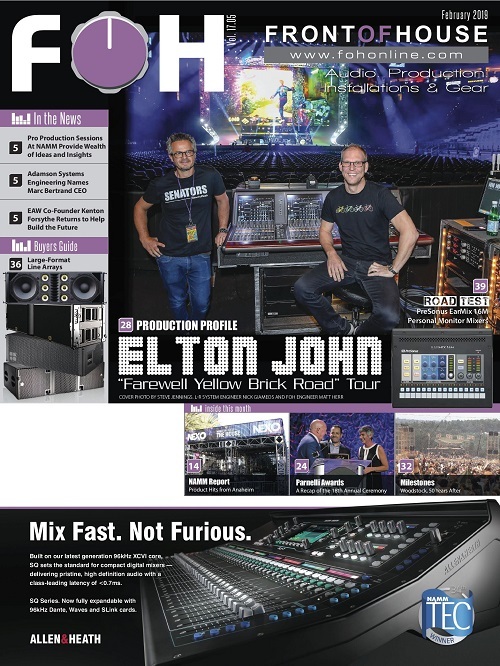 “I basically use what’s on the channel strip and plug-ins that run on the console. I love all the McDSP stuff, especially the AE600 for dynamic control and the 6050 Channel Strip for saturation and compression. Futzbox is used primarily for distortion as well as the EC-300 (McDSP Echo Collection) and NR800 (McDSP Noise Reduction) on vocals. 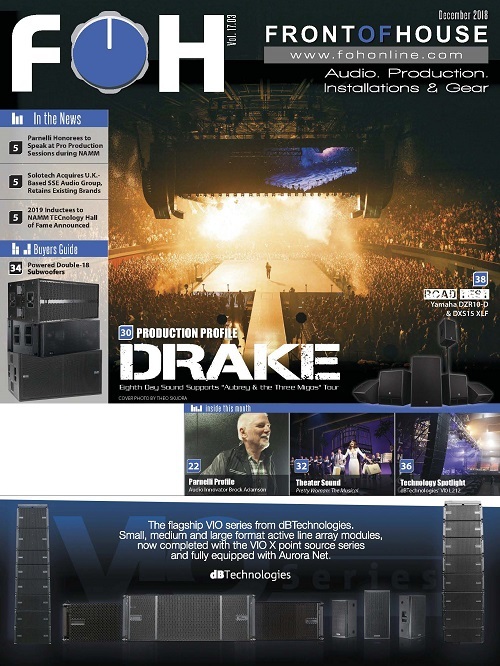 Other favorites include the Sonnox Inflator, Oxford reverb, Crane Song Phoenix 2 and Empirical Labs Arousor.” Pollock also gets a lot of effects for specific songs out of the plug-in bundle that comes with the desk. These are based around distortion, filters, delays, pitch shifting, noise generators and modulation. On the outboard side, Pollock has a mastering chain that lives on his L/R bus. One part of the chain that adds to his overall sound is analog equalization. “I’ve been using the Chandler Curve Bender for years — it’s a great tool to really shape the mix in different environments, especially when things change and you have to do it quickly. 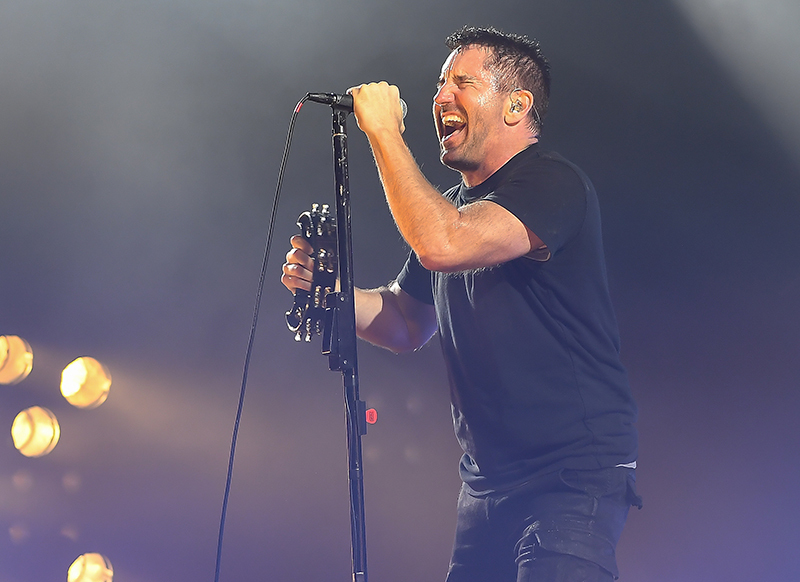 Other than that, I have a few special compressors for go-to inputs and a Bricasti M7 that I use on Trent’s vocal more for spatial placement in the mix than reverb.” Reznor’s vocal mic is a Shure Beta 58. 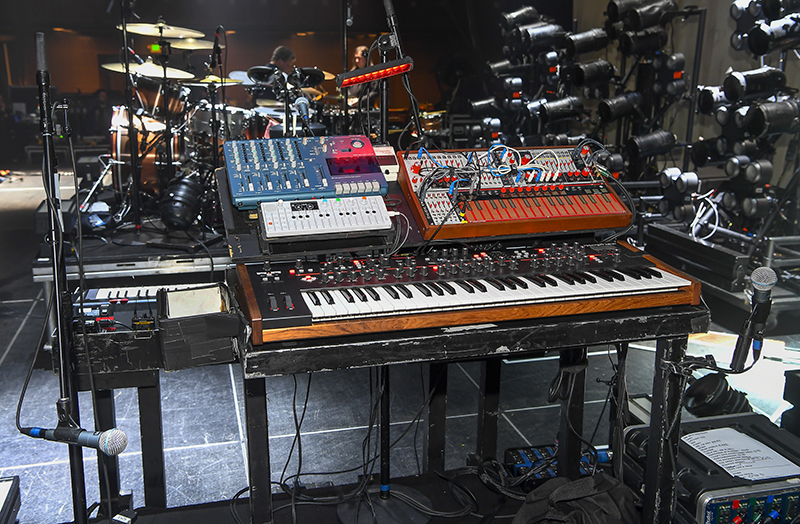 “I feel like I’m always around other engineers using new gear in either live sound or the studio. There’s a lot of great new stuff coming out that rivals some of the classics. When selecting gear choices for NIN, I went with a few things that I thought would be useful with my approach. Some of the new pieces are a tube compressor that a friend of mine, Chip Verspyck, designed with Henry Hirsch called the Clear Compressor. Trent’s vocal can be very dynamic and the unique design of this compressor allows me to have heavy amounts of gain reduction with little effect on the quality of his vocal — it’s been hard to use anything else. I recently got a Sonic Farm Creamliner 3 from Boris Drazzic and after using it in the studio on several tracks, it’s been part of my L/R bus in my live chain. It’s a great tool for adding depth and contour to the mix. 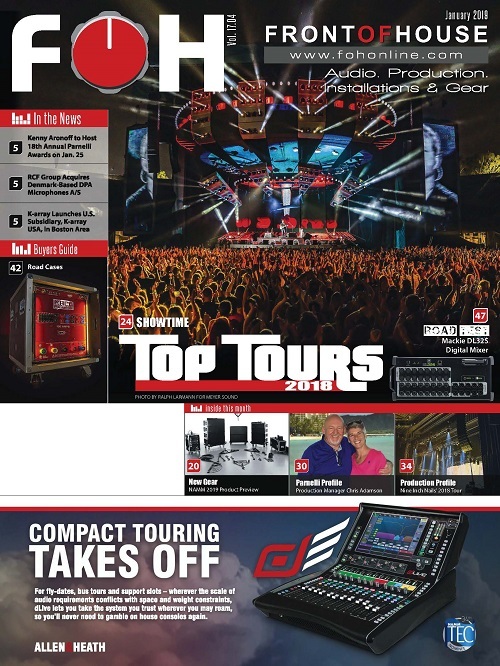 Prowda says everyone is on IEM’s — Jerry Harvey Audio JH16’s or JH16 V2’s. Some have stayed with their JH16’s and some are using the JH16 V2 due to personal preference. 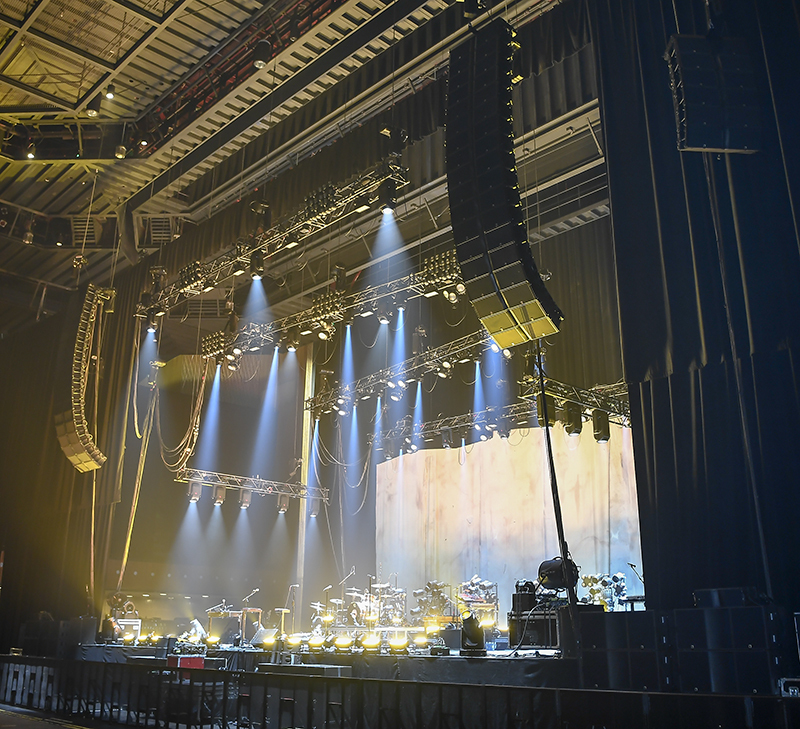 He started using a subwoofer array of the L-Acoustics KS 28’s spaced across the back of the stage a few years ago and the band has stayed with this configuration because it works so well. 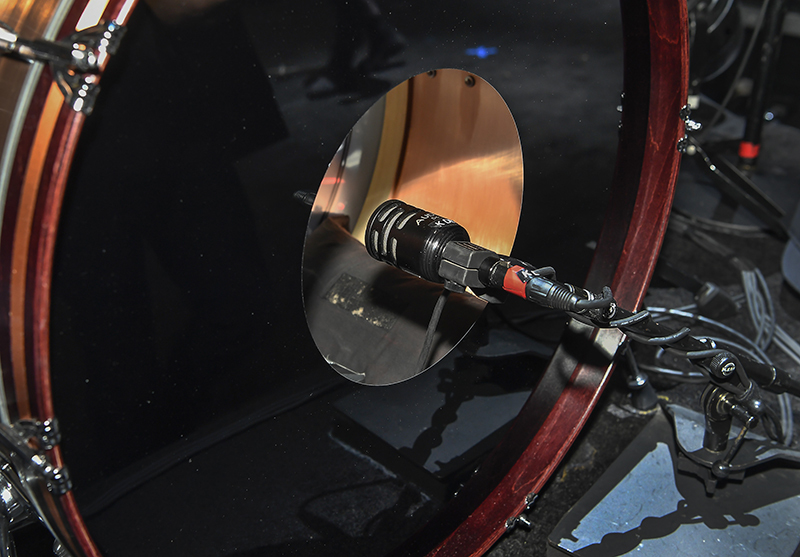 Capturing drummer Ilan Rubin’s kit, the mics include a Shure Beta 91 and Audix D6 on kick. Snare top is a beyerdynamic 201 with a Shure Beta 98 underneath. All toms are Sennheiser e904s. Overheads and hi-hat are Audio-Technica 4051s. 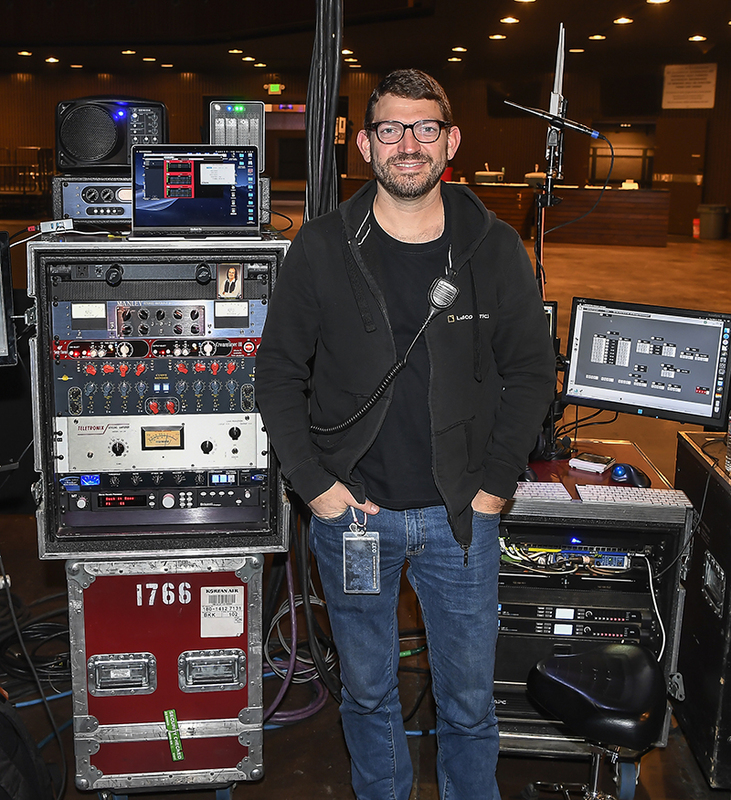 Chris Holmes is the content routing audio manager for the tour. His position is a hub of sorts for MIDI to be sent/received, audio content to be taken and manipulated and — in the past — SMPTE used as a backbone for lighting programming. “There’s gobs of programming happening before we play a single show, and there are constant tweaks as we start performing in front of people,” says Holmes. Around this time, Holmes is also starting to program patch changes, and huddling with the rest of the backline to see how seamless he can make their setup. 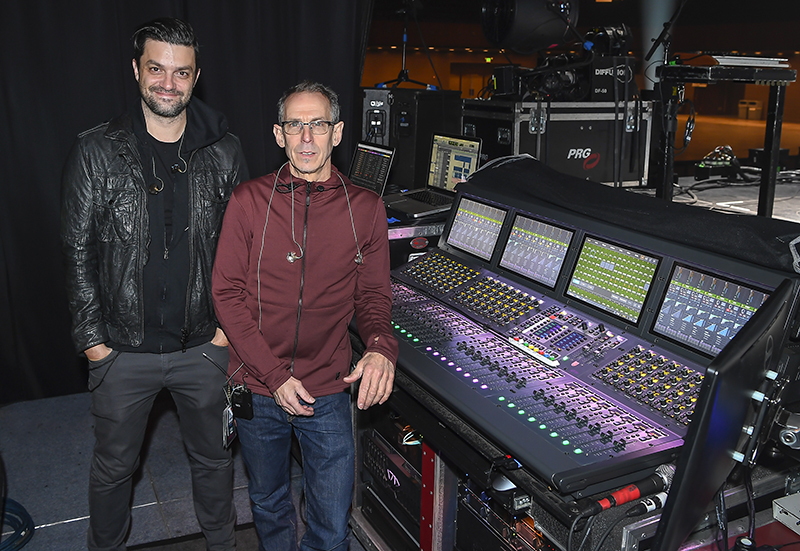 “Anything I can do to help make their jobs easier during a show we’ll work towards doing. Once rehearsals are wrapped, I work on getting all of the appropriate files laid out in Ableton Live, which is the main software I use. In practice we’ve found it provides the most flexibility in our live environment. I can be running it, or it can be set up for Atticus Ross to take the controls and go to town. It runs on two Apple MacBook Pros and synched via MIDI launch notes,” Holmes explains.